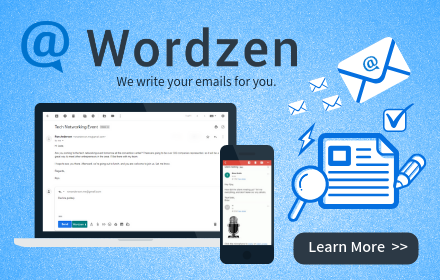 Wordzen is a monthly subscription service that connects you to live editors who are standing by to write and edit your email messages. Subscribe now on our Pricing page. Q: Can I try Wordzen for free? A: Yes. We offer a no-obligation, seven-day trial period. After the seven days, you will be prompted to subscribe to Wordzen when submitting an email. Q: Is Wordzen right for me? A: If you use email to communicate, then you’ll love Wordzen. You can have confidence that your messages are carefully reviewed and phrased, and that our editors will help you make your point or transmit your information with clarity. *Please note that at the moment, Wordzen is available only in English. Q: Does the base subscription plan include unlimited emails? A: For your first month, yes. After your first month as a subscriber, we’ll evaluate your usage and let you know if we need to adjust your subscription fee in order to continue using Wordzen. This is because it costs us more to service a user that submits 200 emails/month to Wordzen than a user that submits 20 emails/month. The base level plan will accommodate our typical user, who submits 20-30 emails/month. If we need to adjust your plan after your first month, we’ll inform you and ask you if you’d like to continue your subscription. You’ll be under no obligation to continue. However, we’re confident that you’ll see the value of having our editors as your 24/7 partners. Try it and see! Q: Why does Wordzen cost more than Grammarly or other online grammar/transcription services? A: Services such as Grammarly use an algorithm-based spell-checker and grammar-checking tool. Wordzen uses real, live human editors to interpret and correct your emails for you for maximum clarity and impact. While our editors also use some automated tools as a double-check, all of the editing is done by hand. That means Wordzen editors will restructure sentences, improve word choices, and make each sentence more meaningful, given the full context of each message. Grammarly and other automated tools can’t do that – the human aspect is what makes Wordzen so special. One great advantage of using Wordzen over time is that our editors get to know you and your business, which makes our editing more powerful. Our editing not only corrects your email but incorporates your point of view as only a human editor can do. We do more than edit; we’re on your side as your partners in communication. Q: My Wordzen account is linked to two different Gmail accounts. How many subscriptions do I need? A: You need a subscription for each individual Gmail account that you wish to use with Wordzen, meaning you need a subscription for each of the Gmail accounts you have linked to even one Wordzen account. In the near future, we will be changing our login to a one-to-one model where each Gmail account is its own Wordzen account, rather than how we currently have it structured, where a single Wordzen user logged into www.wordzen.com can link to multiple Gmail accounts. Q: Can multiple users use my subscribed account? A: No. Your friends and colleagues are entitled to use our free trial to see if a Wordzen subscription is right for them. After the trial, they will need to subscribe individually. If you work for an organization that would like a license for multiple users, please contact us for custom pricing at contact at wordzen.com. Q: Which email address should I enter into the subscription form? A: When you subscribe, be sure to enter the email address of the Gmail or G Suite account that you wish to use with Wordzen. The email address specified there is the one that will be given access to Wordzen services. Q: If I become a subscriber, will you also edit longer form texts such as proposals and website copy? A: The base level plan only includes the editing of normal email correspondence, and our editors use their own discretion to determine when a submission falls outside of that scope. In the future, we may offer longer-form editing for a separate fee. Q: Should I type my email, or dictate it? Which do you prefer? A: Use the method that serves you best, and our editors will adjust to your needs. If you dictate your messages, please speak clearly, directly into your phone or microphone, and avoid background noises. If you’re in a noisy area or a place where you don’t want to be overheard – or if you’re someone who prefers a keyboard to the sound of your voice – feel free to type. FYI, on our side, typed emails can be edited faster than audio messages, although our editors work hard to finish each message as quickly as possible without sacrificing accuracy. We aim for a ten-minute turnaround on each message. A: Please email us at contact@wordzen.com with your best daytime (9 AM-5 PM CST) contact number, and we’ll get in touch to update the card we have on file. Q: How do I cancel my Wordzen subscription? A: We’re sorry to see you go! However, we understand that circumstances can change. Just email us at contact@wordzen.com, and we’ll cancel your paid Wordzen subscription for you. Other questions? Feel free to email us at contact@wordzen.com, and we’ll get back to you as soon as we can. On average, a Wordzen subscriber takes three more deep breaths per day. * Subscribe now and watch the stress of your email to-do list melt away. *Subject to user’s agreement to spend their extra free time relaxing a little bit more.